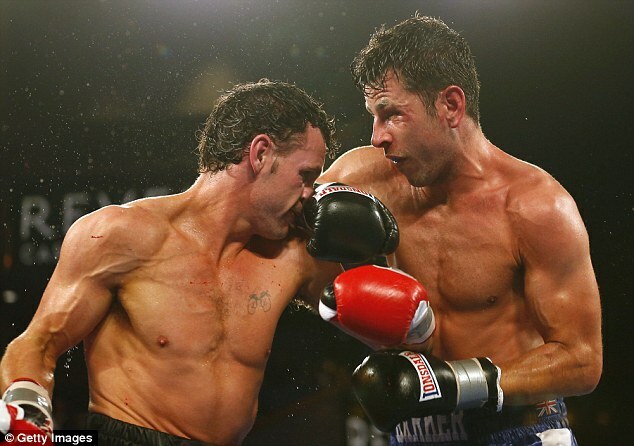 Darren Barker climbed off the canvas to claim the IBF middleweight title in a gruelling encounter with Daniel Geale in Atlantic City. Things looked bleak for the Barnet fighter when he was floored by a body shot in the sixth, but the next time he hit the canvas was in a fit of emotion after it was announced he had won the belt by a split decision. Barker, 31, wept as he dropped to his knees and was congratulated by his team, with tears flowing in all quarters, before dedicating the victory to his brother Gary who died in a car accident in 2006. 'Not many people know the journey I've been through," he said in comments broadcast on Sky Sports 1. 'It's been a real Rocky story. 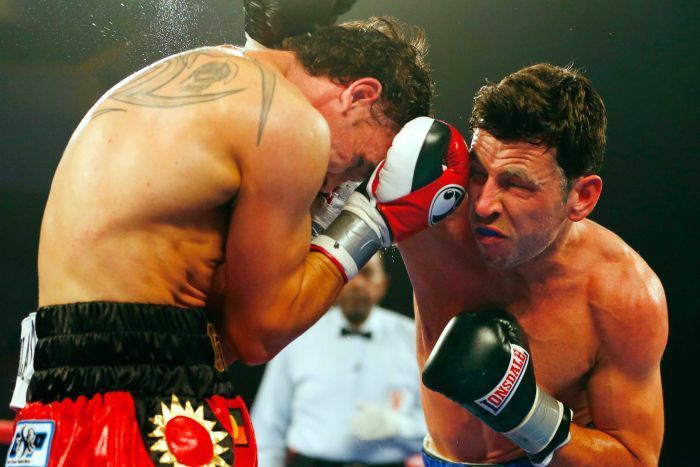 Barker, whose previous world title shot against Sergio Martinez ended in failure in Atlantic City in 2011, appeared to take his Australian opponent by surprise by taking the fight to him. The Briton landed some big early hits and certainly had the better of the early rounds. But he was down in round six when Geale connected with a left hook to the body. The end appeared to be nigh as Geale rained punches in on a dazed Barker, but the Barnet fighter composed himself and ended the round swinging before raising his arms in apparent celebration of withstanding the onslaught. Barker went on the attack again in round seven but, although he was landing plenty of punches, he did not appear to be hurting his opponent. It was developing into a gruelling affair and the physicality threatened to take its toll on Barker, who has struggled with injuries in the past. A lightning combination in the 10th showed Barker, who also landed a big uppercut, still had plenty to offer and he was impressive again in the 11th, but Geale has a reputation as a strong finisher and it was his punches that were landing in the 12th. Despite that, Barker raised his arms in celebration before the final bell had even sounded and that proved justified. 'I take my hat off to Daniel Geale,' Barker said. 'He's a great champion and a tough, tough man. He added: 'I was in absolute bits. I was gone. But as the seconds went on my brother and daughter, they got into my head. Geale said: 'I'm no going to whinge and cry and carry on. I worked so hard, I did everything I had to do. Australia's Daniel Geale has lost the IBF middleweight boxing title to Englishman Darren Barker on a 12-round split points decision in Atlantic City. Geale lost for just the second time in 31 professional fights. Geale is renowned for being dominant over the closing rounds, but it was Barker who finished the stronger apart from the last. Geale also scored well with some right hands, but Barker was often able to land first. Barker was warned by referee Eddie Cotton for pushing down Geale's head. "I'm not going to whinge and cry and carry on," Geale said. "The thing is it didn't go my way tonight, I'm very disappointed, don't get me wrong. "I worked so hard for that, and put everything into that. I hurt him throughout the fight." Barker wept as he dropped to his knees and was congratulated by his team, with tears flowing in all quarters, before dedicating the victory to his brother Gary, who died in a car accident in 2006. "Not many people know the journey I've been through," he said in comments broadcast on Sky Sports. "It's been a real Rocky story. I dedicate this to my late brother. Everything I've done is for him. Gary, this is for you, mate. Darren Barker has won the IBF world middleweight title after climbing off the canvas to claim a split decision success over Daniel Geale in Atlantic City. The 31-year-old Barnet fighter was knocked down in the sixth but recovered to secure an emotional victory, which he dedicated to the brother he lost in a car accident in 2006. 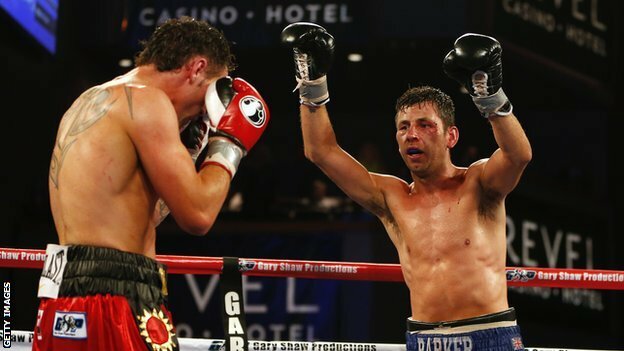 Barker fell short against Sergio Martinez in 2011 in his previous world title attempt but started this fight in determined fashion, landing early shots and having the better of the early rounds. But Geale sent him to the floor with a left hook to the body and seemed set for a stoppage win as he rained punches in on his dazed opponent. However, Barker somehow survived the onslaught and went on the attack again in the seventh as the fight turned into a gruelling slugfest. The Brit landed a fine combination in the 10th and was on the front foot again in the 11th but Geale then landed some nice punches in the final round. But two judges scored the fight in favour of Barker, 116-111 and 114-113, while just one favoured Geale by a margin of 114-113, prompting Barker to hit the canvas again, this time due to a surge of emotion. "Not many people know the journey I've been through," he said. "It's been a real Rocky story. "I dedicate this to my late brother. Everything I've done is for him. Gary, this is for you, mate. "I take my hat off to Daniel Geale. He's a great champion and a tough, tough man. "He caught me right in the solar plexus and completely took my breath away from me. "I was in absolute bits, I was gone. But, as the seconds went on, my brother and daughter, they got into my head. I showed I've got heart and a lot of people didn't think I did." Geale said: "I'm not going to whinge and cry and carry on. I worked so hard, I did everything I had to do. "I could tell he was throwing a lot of punches, whether he was catching me or not, that's to be seen. I felt in control but it wasn't my best performance. Darren's a great fighter and I knew it was going to be tight. I'm very disappointed." 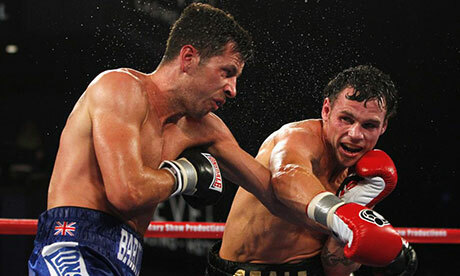 Darren Barker took the IBF world middleweight crown by winning a gruelling fight against Daniel Geale by a split decision in Atlantic City. 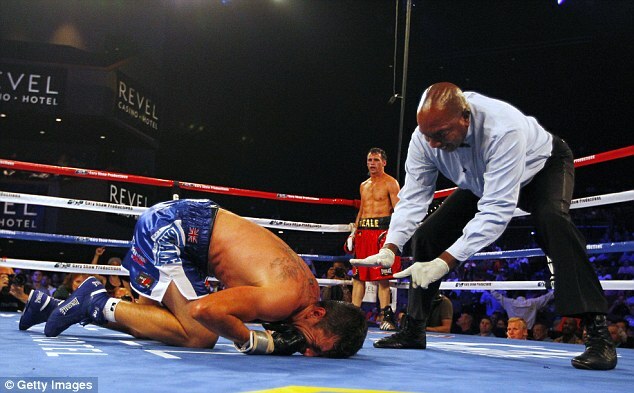 The Briton, 31, was floored by a body shot in the sixth round and just got up before the end of the referee's count. 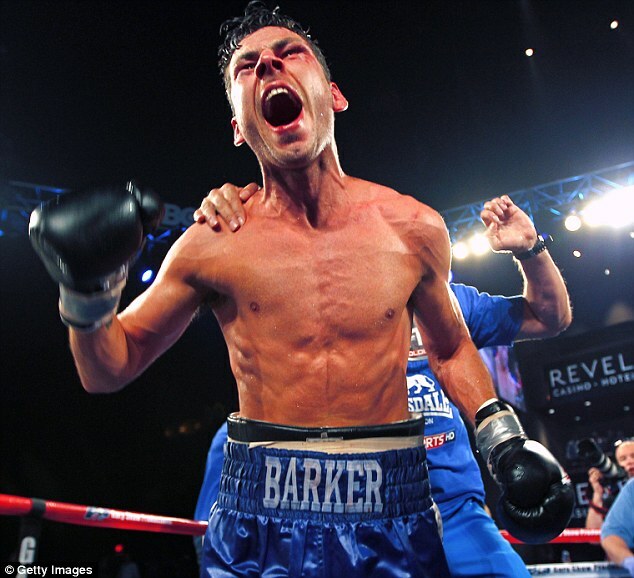 Barker recovered and he went on to win the world title which eluded him in 2011 when he lost to Sergio Martinez. The Barnet fighter dedicated his win to his late brother Gary, who died in a car accident in 2006. "Not many people know the journey I've been through," Barker told Sky Sports. "It's been a real Rocky story. "I dedicate this to my late brother. Everything I've done is for him." Barker took the fight to Australian Geale and had the better of the early rounds before being caught with a powerful left hook to the body in the sixth. 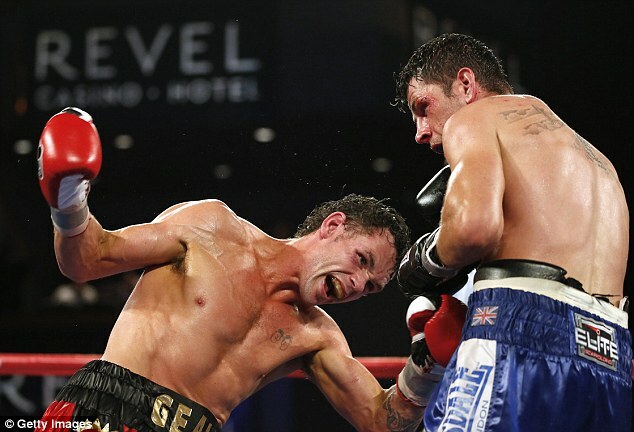 Geale appeared to be taking command of the fight but Barker emerged from his rival's onslaught to finish strongly. "I take my hat off to Daniel Geale," Barker said. "He's a great champion and a tough, tough man. "He caught me right in the solar plexus and completely took my breath away from me." He added: "I was in absolute bits. I was gone. But as the seconds went on my brother and daughter, they got into my head. "I showed I've got heart and a lot of people didn't think I did. Barker was warned by referee Eddie Cotton for pushing down Geale's head. "I'm not going to whinge and cry and carry on," Geale said. "The thing is it didn't go my way tonight, I'm very disappointed, don't get me wrong. "I worked so hard for that, and put everything into that. "I hurt him throughout the fight."